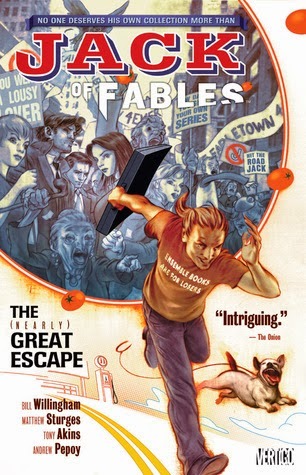 After working my way through the first 12 or so volumes of the Fables series, it was time to start reading the Jack of Fables series before it crosses over to the main series again, and I have to say the thought of doing so underwhelmed me. I am always a completist though, so if it is best to read series in a particular order then I will definitely try to. Part of the reason that I was underwhelmed is that I didn't really like Jack all that much when he made brief appearances in the main Fables series, so the thought of having six graphic novels to read where he is the main character wasn't all that appealing. And I was right to be a little concerned because, compared to many of the other Fables collections that I have read, this wasn't my favourite. Having said that, in the end, I didn't dislike it as much as I could have! When we met Jack in the main Fables series he was living the highlife in Hollywood where he was involved in the movie industry. Having been ostracised by the Fables community for revealing secrets, he is kicked out of Hollywood with a suitcase filled with cash (a mere fraction of his financial worth) and the clothes on his back. He doesn't get very far though as he is abducted off the streets and taken to the Golden Boughs retirement home. Mr Revise is the head of the home and his mission is to keep renegade fables imprisoned until such time as no one believes in them anymore when they can then disappear without a trace. Jack being the arrogant womaniser that he is, it doesn't take long before he has hooked up with a woman, but that arrogance and self belief also means that he is not one to accept that it is his fate to be hidden away in this pseudo-prison so it isn't long before he is trying to gather together a group of characters to help plan an escape. This brings Jack into conflict with the man in charge of Golden Boughs, Mr Revise and his assistants. Part of the fun of this series is seeing what other Fables characters have been put out to "retirement" at Golden Boughs. Some are obvious, others are surprising and some are characters that I have no recognition of at all. In the end, I will continue with the series (completist, remember) but I will do so knowing that I am really looking forward to returning to the main story rather than really looking forward to this spinoff. Think you know the greatest Fable of them all? After earning a fortune in Hollywood by cashing in on his own legent, Little Jack Horner - a.k.a. Jack the Giant Killer - is now the most famous Fable alive. Sure, he's been stripped of his wealth, and banished from Fabletown forever as a result, but Jack has always been a wanderer at heart, and the open road is like a home to him. So it's a real shame when he's plucked off the pavement and unceremoniously tossed into a gulag filled with other renegade Fables. Within the walls of the Golden Boughs Retirement Home, however, Jack finds allies as well as enemies - and once he learns the ultimate goals of his jailer, Mr Revise, breaking out becomes more than just a point of pride. Of course, over all the centuries that Revise has run his prison, no one has ever escaped from it. But hey, he's the Jack of the Tales! How hard could it be? You are like me... I don't like Jack as much as the mainstream Fables. Do they get better though? I found it hard to get through the Jack books, but I'm glad I did because I'm not sure I would have understood the Crossover book otherwise. And that is precisely why I will keep going with the Jack books Beth!